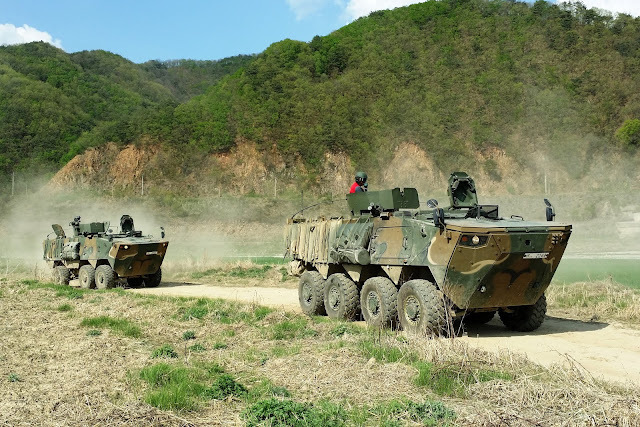 Hyundai Rotem Co., the rolling stock and arms manufacturing unit of Hyundai Motor Group, said Friday it will build two kinds of wheeled armored vehicles for the South Korean Army by 2020. Hyundai Rotem inked the 390.7 billion-won (US$357 million) order with the Defense Acquisition Program Administration (DAPA) and will build the wheeled armored vehicles at its plant in Changwon, about 400 kilometers south of Seoul, the company said in a statement. The two models are the K806 and the K808, the company said without giving the number of ordered wheeled armored vehicles. Based on the contract, the company aims to export the wheeled armored vehicles to overseas markets, such as the Middle East, Latin America and Southeast Asia, from next year, it said. Ogden has been screaming that the USMC needs to do a design study to see if a 6x6 version of whatever wins the ACV should be conducted to see if we can get a future replacement for the LAV-2 at the same time...as well as get a bit of vehicle commonality to save on maintenance/sustainment...but that thinking seems to be missing from what HQMC considers a priority. The S. Koreans seem sold on the concept though. We'll see how this goes. Consider this another example of how others are doing it faster than we are. Think about it like this. If you go back to the Marine Personnel Carrier days (MPC) then we're behind by about 7 years. If you go back to when the ACV was first mouthed (and remember it was an off the shelf buy) then we're behind by only 5. The problem? Brazil and now S. Korea have scratch built vehicles and will have them into service before we get our "off the shelf buys" thru testing.